It’s happened — a storm has rolled through your area and damaged your roof with hail, winds, or debris. Or a heavy snow and backed up water compromised what protection you thought you had. Now you have to file a claim with your insurance company. And you have to find a good roofing company. Fast. In the midst of a crisis, it can be difficult to identify who to trust with such an investment. 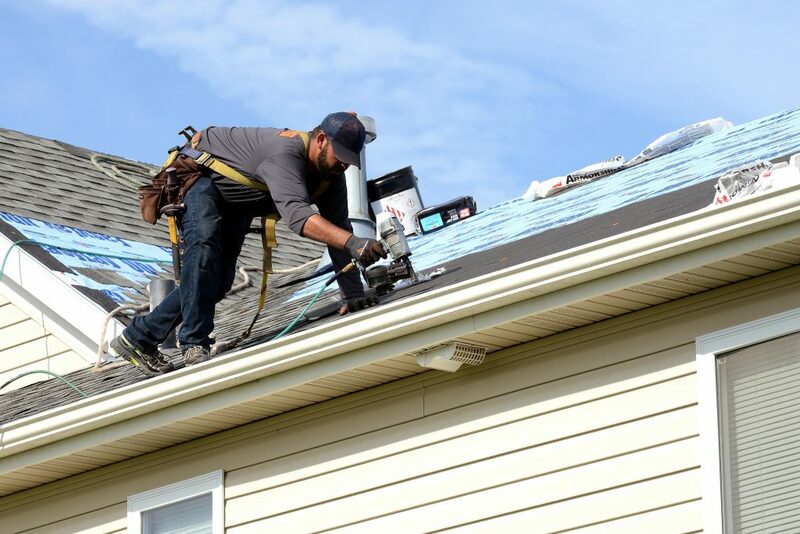 Between out-of-state roofers who comb neighborhoods after a storm for business and the list of roofing contractors online, there are too many choices to make a good decision in a pinch. As a rule of thumb, don’t choose the out-of-state contractors, called “storm chasers” or “roofing gypsies” for your roofing needs. While not all of these roofers are bad business people, scammers regularly travel with these crowds, and they take advantage of homeowners during the crisis. Storm chasers can get away with poor quality jobs, too, because they aren’t held accountable for their work; they aren’t local and don’t depend on positive reviews and word of mouth for business. To help you find a good roofing company, we’ve put together the following guide below. Keep in mind that some roofing contractors offer free pre-claim inspections, so consider contacting them before you contact your insurance company in order to protect yourself against a hike in your insurance premium after filing an unnecessary claim. Before going online, do some old-fashioned detective work. Ask our neighbors, relatives, friends, and coworkers about local roofing companies they’ve had experienced with. Ask some follow-up questions, too, about the company’s work. Did the roof leak a few years after installation? Did the crew keep the area clean? Was the project completed in a timely manner? Referrals from people you trust can help ease the tension of a stressful situation. When looking for a roofing contractor online, take a look at the reviews. What have others said about them? Take reviews with a grain of salt, however. It’s more common that unhappy customers will leave a review than satisfied ones, and not every problem negative reviewers complain about is the company’s fault. Be wary also of false positive reviews. Companies will sometimes have employees, relatives, and business contacts fill out positive reviews to boost their online reputation. While you can’t always tell a fake review from a real one, you can likely trust reviews with specifics in them. Fake reviews are often vague. They don’t explain what service the company being reviewed performed and why they, the reviewer, liked the company. Real reviewers will add details. Despite their drawbacks, reviews are a powerful tool for finding a roofing expert you can trust. They can help you identify trends both positive and negative with companies, and they can warn you against scammers. You can find reviews by doing a search on Google, LinkedIn, Facebook, Yelp, BBB.org, and others. Company websites vary in style and appearance. Don’t judge a contractor on how fresh their website looks; use it to gather information and to determine whether they are truly local. Storm chasers and scammers will commonly even set up a storefront in an area after severe weather in order to look legitimate, but they’re less likely to have a website than companies that have been around a while and want to be found online. If you’re still unsure who to trust, contact your insurance agent. He or she can recommend a local contractor, one the agent has likely worked with before. You can be fairly certain that the contractor your insurance agent sends you will do a good job. After all, the insurance company will be liable for that roof under the right circumstances. Yes, this is a blatant self-promotion. We at E3 Roofing & Restoration will always do a good job repairing or installing your roof. We provide pre-claim inspections, and we will help you through the insurance process if a claim is necessary. We’ll even advocate on your behalf to make sure you get what you need from your insurance provider. We’re dedicated to responsibility at our worksites, and we strive for excellence. Contact us now to schedule your inspection or to request a quote on a roofing job.